Jai Sri Ram! Pray you are doing well! Please accept the heartiest congratulations of the Sant Fraternity on your deservingly becoming the Rashtrapati – the First Citizen of the country – to preside over the destiny of our Chiranjeev Bharat Rashtra, which is also the biggest democracy of the world. Unenviable indeed is your position in these challenging times. But then, being very deeply rooted in the Himalayan Tradition, may Maa Durga bless you with all the strength and courage to perform your tasks well for the cause of Bharat Mata! 2. We were in the 2013 edition of the Dharma Sansad (Parliament of Spiritual Leaders) that was held on February 07, 2013 during the recent Purna Kumbh Mela at Prayagraj (Allahabad). 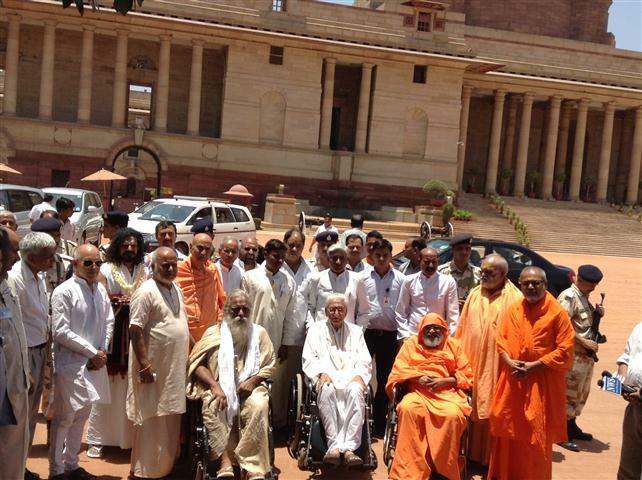 It was presided over by Pujya Jagadguru Sankaracharya of Kanchi Kamakoti Peetham Swami Jayendra Saraswatiji Maharaj. At the national platform of Dharma Sansad a great number of Sant-Mahatmas, Jagadguru Acharyas, Dharmacharyas and Mahamandaleshwars representing the multi-dimensional spirituo-cultural tradition of Bharatvarsh deliberated upon some matters of national importance and appealed to the national society of Bharat to come together to address these matters in cooperation with the Government of Bharat and the Parliament of Bharat. 10,000+ audience present from the Sant-Fraternity of the country witnessed live the proceedings, in turn carrying the message, along with lakhs of volunteers, to all the 650,000 villages and townships of the country mobilizing people to chant ‘Sri Ram Jai Ram Jai Jai Ram’ Vijay Mahamantra individually and collectively to boost the movement for national resuscitation, rejuvenation and renaissance. The Dharma Sansad through the Central Margdarshak Mandal – the Core Team of Sants – entrusted us with the responsibility of meeting you Rashtrapati Ji to acquaint you with the issues, concerns and their feasible solutions as discussed in the Dharma Sansad, and urge upon you to address the same at your level. Here we are as a matter of our Rashtra Dharma and Fundamental Duty (Daayitwa) to have an interface with the First Citizen of our Great Country to discuss issues pertaining to Shri Rama Janm Bhumi, Goraksha, Ganga Raksha, the misnomer of ‘Hindu Terrorism’, Security of Women – our Matri Shakti, Dangers for Hindu Demography, Plight of Hindu Temples and their properties at the hands of governments. “1. The disputed site is the birth place of Lord Rama. Place of birth is a juristic person and is a deity. It is personified as the spirit of divine worshipped as birth place of Lord Rama as a child. Spirit of divine ever remains present everywhere at all times for anyone to invoke at any shape or form in accordance with his own aspirations and it can be shapeless and formless also. 2. The disputed building was constructed by Babar ………….. it was built against the tenets of Islam. Thus, it cannot have the character of a mosque. [vide judgment of Hon’ble Mr. Justice Dharam Veer Sharma, Allahabad High Court (Special Bench, Lucknow)]. (3ii) Placing the record straight for Your Excellency's appreciation, it is pointed out that Hindu Parties in the Suits had pleaded that Allah does not accept Namaz or Dedication of property (Waqf) which is obtained by force and without title and cited injunctions of Koran and Islamic tenets which do not permit construction of Mosque at the site of a Temple by demolishing it (vide Paras 25 & 28 of Written Statement of Defdt No. 13 and para 41 of WS of Defdt No. 20 in Sunni Boards' Suit and para 24 of Plaint of Bhagwan Shri Ramlala's Suit). Justice D.V. Sharma specifically dealt with Koran and Islamic tenets and held that no right accrued to Babar as conqueror to make dedication of disputed structure as Mosque (vide page 2975 of Vol. 3 of published judgment). Justice Sudhir Agarwal held the issue to be irrelevant and left it undecided (vide para 3429 of Vol. 2 of published Judgment), while Justice S.U. Khan did not touch the issue of illegality for violation of Koranic injunction & Islamic tenets, but only held that Muslims used to offer Namaz only from 1934 to 22nd of December, 1949 (vide page 100 of Vo. 1 of published judgment). Nevertheless, Justice S.U. Khan’s words at Point # 2 in his gist of findings speak volumes against the Waqf status of the premises in question, i.e., “2. It is not proved by direct evidence that premises in dispute including constructed portion belonged to Babar or the person who constructed the mosque or under whose orders it was constructed” Hence the recorded finding of Justice D.V. Sharma stands elevated to the position of the finding of the High Court. (3iii) The 3-Judge Special Bench of Allahabad High Court gives the unambiguous and unanimous verdict that the birthplace of Ramlalla Virajman is at the Ram Janma Bhumi in suit and that the Babri structure was not put up on a virgin land but illegally parked on a Hindu Temple/place of worship. (3v) All the 3 Judges held unanimously that the disputed area contains the birthplace of Lord Rama. According to Justice S.U. Khan and Justice Sudhir Agarwal only the site of the Central Dome of disputed structure was the birth place; according to Justice D.V. Sharma, the entire disputed area is the birthplace. (3vi) The cumulative effect of these findings is that, on the one hand, Shri Ram Janma Bhumi contains the birthplace of Lord Ram, on the other hand the Babri Masjid was a prohibited structure void ab initio. The only obstruction in wholly enforcing the rights of Bhagwan Shri Ramalala over the entire disputed area is the direction of Justices S.U. Khan and Sudhir Agarwal to partition the disputed area into 3 equal parts so that each of the three Parties, viz, Bhagwan Shri Ramlala, Sunni Board of Wakf as representative of Muslims, and Nirmohi Akhara, would get 1/3rd share of disputed area in the final decree for partition. This direction for partition was treated by Supreme Court, while admitting Appeals by Parties, to be prima facie wrong, hence the operation of High Court Judgment was stayed. (3vii) So considered in its totality, fairness and justice demands that disputed area be handed over to Bhagwan Shri Ramlala, as undertaken by representatives of Muslim Community during negotiations as recorded in White Paper, and undertaking given to Supreme Court on behalf of the Central Government by Solicitor General of India as indicated above. (3viii) Speedy justice is a Fundamental Right of every Citizen under Constitution of India. It took more than 60 years for the dispute to be decided by High Court. It is by no means clear how much time it may take before the Supreme Court finally decides the matter. Heaven forbid, if Supreme Court remand the case to High Court, it may take another 10 or 20 years. Even if it is not remanded, every Party is entitled to approach Supreme Court again by way of Review under Article 137 of the Constitution. It is in national interest to finalise this matter of national importance at the earliest; hence Parliament may finalise it by an Act. (3ix) It is relevant that, a few years ago, Parliament passed an Act to maintain status quo of all Places of Worship as on 15th of August 1947, excluding Shri Ram Janma Bhumi-Babri Masjid dispute due to pending litigation. It is now time that this dispute be also taken up by Parliament and hand over the disputed area to Bhagwan Shri Ramlala Deity as His birthplace. (3x) Parliament of India consists of President of India and the two Houses - Lok Sabha & Rajya Sabha – under Article 79 of the Constitution. Your Excellency has unfettered power under Article 86(2) of the Constitution to send Message to either of the two Houses (or even to both Houses sitting jointly); it is the constitutional duty of the House to consider any such matter "with all convenient dispatch". (3xii) Your Excellency, now is the opportunity for you to rise in aid ofShriRamTemplein Ayodhya. (B) ask the Government of India to honour its categorical commitment that “…If the question referred is answered in the affirmative …government action will be in support of the wishes of the Hindu community...” and, thus, now, in the wider national interest, hand over the entire 70 acre campus for the construction of a Shri Ram Temple at Shri Rama Janma Bhumi, Ayodhya as desired by the people of the country led by prominent spiritual personages who have been playing a key role in the Ayodhya Movement for the cause of a grand Temple of Nativity dedicated to Shri Rama. It is on record that as many as 60 million Hindu devotees from 300,000 villages of Bharat have sent ‘Ram-Shilas’ (consecrated bricks) along with a ‘Pranaami’ of IRs. 1.25 each to Ayodhya as a token of their direct participation in the reconstruction effort of theTemple for Prabhu Shri Ramchandra at His Birthplace in Ayodhya. (C) ask the Government of India to solve the Shri Ram Janma Bhumi issue by a Law of Parliament of Bharat as it is a spirituo-cultural issue of Hindus having vital importance for national self-esteem/Rashtriya Swabhiman and national reconstruction on indigenous lines. (D) ensure in the said Law of Parliament that no new mosque or Islamic Centre or Islamic Monument would be built within the cultural/scriptural boundaries of Ayodhya as it is a city of worship and it is to Hindus what Mecca is to Muslims – which is out of bounds for non-Muslims. Ayodhya – the ancient centre of pilgrimage on the banks of the holy river Sarayu – is held in very high esteem by our national society by virtue of its being the backdrop of much of Hindu scriptures, birthplace of the Seventh Incarnation of Bhagwan Vishnu, namely, Lord Rama, and the sacred birthplace of no less than five Jain Tirthankars, viz., Adinath – the first Tirthankar, Ajitnath – second Tirthankar, Abhinandanath – fourth Tirthankar, Sumatinath – fifth Tirthankar, and Anantnath - fourteenth Tirthankar. Originally Ayodhya of celebrated Ram Rajya – also known as Saket – was also the capital city of Kosala Kingdom under the rule of great Suryavanshi Kings such as Raja Ikshvaku, Prithu, Mandhata, Harischandra, Sagar, Bhagirath, Raghu and Raja Dasarath where people fearlessly cultivated and addressed their respective calls of Purushaarthas of Dharma (law & order), Artha (need-based prosperity), Kama (legitimate needs and desires) with a focus on Moksh (goal of Self/God-realization). The Atharvaveda described Ayodhya as "a city built by Gods and being prosperous as paradise itself." According to Jain Agamas, it is the second eternal city after Shikharji, and will never vanish or disappear during the changing epochs. It is also celebrated by Hindus as the First of their seven Moksh-Daayini Teerthas (Fords of Liberation), viz., Ayodhya, Mathura, Maya (Haridwar), Kashi, Kanchi, Avantikapuri (Ujjain) and Dwaravati. This elevated status of this Ford of Liberation justifies its having the freedom to securely observe its practices under the presiding presence of Bhagwan Sri Ram and the great Tirthankaras as prompted by this country’s Rishi-Krishi Culture (Kulaachaar), without disturbance. 4. In view of our tradition and also Article 48 of the Directive Principles of State Policy of the Constitution of Bharat that reads: “The State shall endeavour to organise agriculture and animal husbandry on modern and scientific lines and shall, in particular, take steps for preserving and improving the breeds, and prohibiting the slaughter, of cows and calves and other milch and draught cattle” as also Clause (g) of Art. 51A (Fundamental Duties as enunciated in the Constitution of Bharat) asks us “to protect and improve the natural environment including forests, lakes, rivers and wild life, and to have compassion for living creatures”, the Dharma Sansad demanded a Bill for a Central Law for preserving our Gow-Dhan – which is complete ecology and a celebrated partner of man for the cause of his sustainable and nature & life friendly model of development – and asked for a total ban on the slaughter of cow & its progeny. According to survey statistics, the indigenous cow species may be totally extinct within 20 years, and it is thus a matter of grave concern for the Mahatmas and our future generations. The Dharma Sansad passed a unanimous Resolution for Cow Protection. 5. As our tradition says and as enunciated in Article 51A (Fundamental Duties in the Constitution of Bharat) asking us to take care of the ‘heritage’ and ‘rivers’ of our country, the Dharma Sansad demanded to save our National & Divine River Ganga just as our National Honour, Emblems, Names, etc., are protected under specific National Codes and Acts. The Bhagirathi and the Alaknanda join to form the blessed perennial river Ganga that runs right up to Ganga-Sagar in Bay of Bengal. The government interference on the uninterrupted flow of the Ganga and the draining of toxic and lethal industrial and city effluents into it has now made its holy water (that once had no expiry date) unworthy of even Achamanam. It is a matter of grave concern for Mahatmas as the Ganga is the soul of our great Rishi-Krishi Culture and Motherland. The Dharma Sansad passed a unanimous Resolution for Ganga-Raksha, i.e., for the restoration of theNationalRiver to its clean and uninterrupted status. 6. Hindus are Nationalists and not ‘terrorists’ or ‘communalists’. The Central Home Minister disparaged Hindus with baseless allegations of being ‘Hindu Terrorists’, ‘Saffron Terrorists’, etc. Such irresponsible, inflammatory remarks prove that he is unfit to be Home Minister of the country. The Dharma Sansad demanded that he should immediately be removed from this post and the Government of India should apologise to the Hindu society for his unfounded allegations. The Dharma Sansad also demanded that all the Governments of the country should withdraw all policies and projects that practice ‘appeasement’ politics, and bring about a Common Civil Code so that the fruits of all developmental plans and projects are enjoyed by all citizens. Neither ‘Tiraskaar’ nor ‘Puraskaar’ (appeasement) but ‘Pariskaar’ is our indigenous approach. The Dharma Sansad passed a unanimous Resolution addressing this matter. 7. Clause (e) of Article 51A (Fundamental Duties) of the Constitution of Bharat asks the people “to renounce practices derogatory to the dignity of women”. But, unfortunately, today the market forces have undermined their ‘dignity’ and made them a marketable commodity. Further our ‘secular’ Governments and the modern education systems promote the erroneous notion that we are ‘Dharma-Nirpeksh’, those who have nothing to do with ‘Dharma’. But the Bharatiya genius appreciates that ‘Dharma’ stands on the four principles of austerity (tapas), cleanliness (saucha), compassion (daya) and truthfulness (satya). We are at a loss to understand how anyone has the temerity to ask us to give up all or any one of these universal principles of humanism. We cannot, therefore, be ‘Dharma-Nirpeksh’ but ‘Dharm-Saapeksh’. We assert that Bharat should be declared a ‘Spiritual’ country and not a ‘secular’ country. The grain of spirituality can build bridges across various schools of religion that have roots in the country as well as those that have their roots outside the country. The Dharma Sansad Resolution on “Mahila Suraksha” demanded the teaching of morality and ethics in all levels of education, a ban on undignified depiction of women in the media, implementation of the Verma Committee recommendations (including the recommendations pertaining to politicians), capital punishment to rapists, 16 years of age instead of 18 should be taken as the age for a major, so that a criminal cannot be exempt from the law by virtue of minor/juvenile status. 8. The Dharma Sansad also discussed the alarming fall in the graph of Hindu demography after independence due to large scale conversions to Islam and Christianity, non-acceptance of the Common Civil Code by Muslims, and infiltration of over 30 million Bangladeshi Muslims into Bharat, as a matter of very great concern. Survey Experts on Demographic Studies and patterns have predicted that if such trends and conditions continue, within 50 years Hindus in Akhand Bharat would be reduced to a minority. The Dharma Sansad urged upon the Government of India to bring about a Common Civil Code to address the issue of our country’s Demography. The agenda of ‘Family Planning’ should be implemented in case of either one and all or none at all. Just as Muslims accept the country’s Common Criminal Code, they, along with all citizens should be accountable to the Common Civil Code. The Dharma Sansad also urged the GOI to effectively address the issue of infiltration of Muslims into Bharat. 9. The Dharma Sansad also discussed deplorable plight of Hindu Temples at the hands of ‘secular’ governments. Thousands of Hindu temples and their Devottar-Sampatti – assets of the presiding Deities worth billions of rupees – have been taken over by the Endowment Boards. The Dharma Sansad demanded that all the properties and assets attached to the temples prior to their take over should be handed over to the Hindu society. The Mahatmas felt that the misappropriation of the resources and management of Hindu Temples by the ‘secular’ Governments is unconstitutional, and a grave crime against Hindu Dharma which must be addressed. Wishing you God-speed in the service of the Motherland!